Last week, the World Bank held public hearings in Russia to discuss environmental impact studies around Lake Baikal in Russia, moving two mid-sized hydroelectric dams in Mongolia on Selenga River flowing into Lake Baikal another day closer to fruition. Lake Baikal is a UNESCO World Heritage site, so anything going up there now requires United Nations oversight. 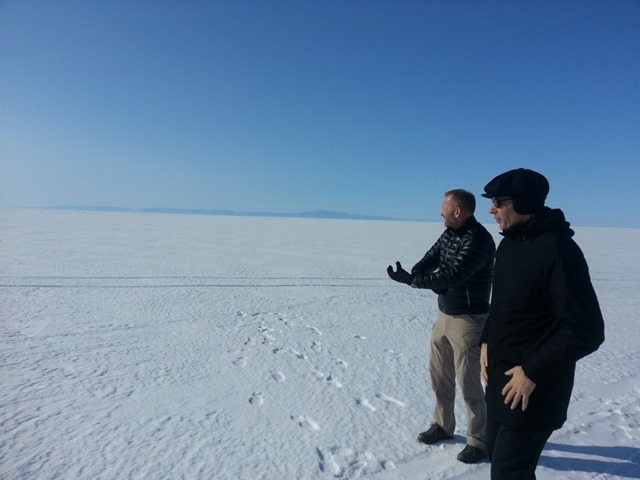 Yuri Myroshnichenko (front) and Wolfhart Pohl (back) from the World Bank Task Team overseeing Shuren and Orkhon dams first time look at the Lake Baikal threatened by their project. (Photo: RwB). "I’ve been to the hearings about the Mongolian projects. People don’t want dams along Lake Baikal, even in remote upstream areas," says Eugene Simonov, international coordinator for Rivers Without Borders. "Russians would resist even more if someone proposed a dam on the Selenga River inside the country," he says of the lake’s most important tributary. The Selenga watershed area is shared between Russia and Mongolia and is a major point of contention for building the dams. The delta is mainly flooded meadowland and is considered a Ramsar Convention protected site. Over the last two years, at least 8 consultation meetings were set up between people in nearby towns in Russia and Mongolia and other stakeholders with the officials in charge of Shuren(Selenge River), Orkhon and Egiin Gol river dams projects. In that period, Russian and Mongolian environmental groups filed complaints with the World Bank, trying to get them to balk at the project. Their offensive really began in earnest in the first half of 2015 when the World Bank’s Inspection Panel team arrived to meet with stakeholders. 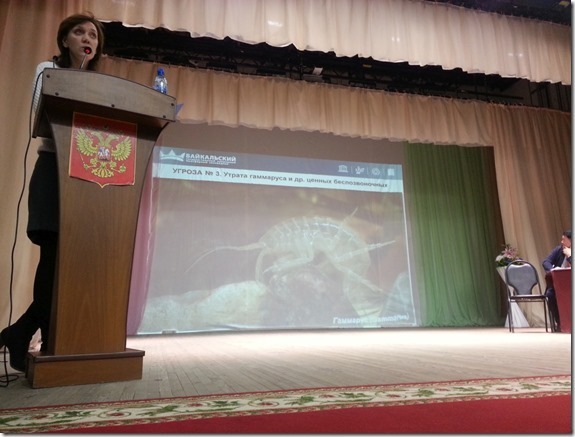 The U.N. World Heritage Committee also got involved and in May 2015 requested that both sides submit impact studies and conservation updates regarding the Baikal basin to better assist with the fallout should those dams get built. It’s an uphill battle, but wheels are in motion. The Bank has already loaned the Mongolan Ministry of Finance around $13 million of the $25 million planned just to finance studies on the projects. As of November, and after two years of talking with conservationists and local communities, these projects have moved from a World Bank overall risk assessment rating of "substantial" to "high". If you were to color code it, the World Bank’s thoughts on the dams have gone from cautionary yellow to fire engine red. It is hard to see how that risk comes down and makes this an attractive deal. Mongolia’s Mining Infrastructure Investment Support Project, the group working with the World Bank on impact studies, was unavailable for immediate comment. Environmental hot spots from the Brazilian Amazon to China’s Yangtze River are full of stories about major hydroelectric projects that had the attention of global NGOs and plenty of doubts among the locals, only to see trucks move mountains of dredged dirt out of river beds to change the course of natural history. Lake Baikal is not immune from the same outcome. Lake Baikal has faced Russia’s industrial wrath before. Paper and pulp industry pollutants have been a source of problems. The Baikal Paper and Pulp Mill was shut down in 2013. Russia has no plans of building new hydroelectric power plants in the basin and there are already restrictive legal protections in place for industry, according to Rivers Without Borders. As lakes go, Baikal is Amazon-esque, which makes it a hot spot for environmental groups even in Russia, a country whose government is not known to be all that worked up about clean energy. Baikal is the deepest and oldest fresh water lake in the world. It holds 20% of the world’s unfrozen fresh water. To put that into perspective, only 2.5% of the planet’s water is fresh water, and 68.9% of it is frozen. The Baikal holds more fresh water than all of the Great Lakes combined. It is located in south-central Siberia, not far from the Mongolian border, and is home to an estimated 2,000 species of plants and animals like the Baikal seal, most of which can only be found there. Mongolian government announced its plans to build three hydropower plants on the Selenga river and its tributaries – the Orkhon river and the Egiin river — some four years ago now. The dams are not monstrous. The Shuren dam along Selenga will have just 245 megawatts of installed capacity, and the Orkhon and Egiin Gol will have 100 MW and 315 MW respectively. By comparison, China’s Three Gorges Dam has 22,500 MW of installed capacity, making it the world’s largest by far, with Brazil’s Belo Monte dam having 14,000 MW. Dams are low-carbon energy, but they need reservoirs, which mean rivers need to be rerouted, changing flows and impacting fish and wildlife. A few articles have been written about the dam over the last couple of years, but Baikal’s Siberian isolation — coupled with Russia having a relatively small environmental activist base — has made it a bit harder for it to get attention. By many estimates, the Belo Monte, like the Three Gorges Dam, was a financial and environmental mess. Russian film makers are trying to prevent more build up in Baikal in a new documentary expected to come out next year. Even Vladimir Putin has a hand in this. For a man that is supposedly inching closer to China, Vladimir Putin has seemingly taken the side of Lake Baikal. It may also have to do with Sergey Ivanov, his former Defense Minister, Chief of Staff, and the head of the Presidential Administration. The powerful Ivanov is now Russia’s environmental czar. Two weeks ago, he told Moscow-based Russia 24 that he doubts Mongolia will go ahead with at least one power plant, the one on the Selenga River. In late June 2016, Putin told the Mongolians and Chinese that the dams could be a problem for Baikal. Why involve the Chinese? Because they were the ones putting up the capital to get at least one dam built. "Russia and international environmental protection organizations have made their position on these plans known: this project could create some risks for water supply to Russia’s Irkutsk Region and affect the unique ecology of Lake Baikal," Putin said. Without Putin’s blessing, China stood down. China’s Export Import Bank had agreed to lend $1 billion to the Egiin Gol power project following a technical study by Tractebel Engineering, a subsidiary of French natural gas firm Engie. Three weeks after meeting with Putin, on July 10, 2016, ExIm opted out. Mongolia wasn’t happy. Environmental groups want them to consider building wind and solar farms in the Gobi desert which, after all the money spent to build a dam to harness cheap hydro power, may end up being just as financially sound. They fear that if the Mongolians manage to secure financing for the projects, the impacts on Baikal will be "disruptive". “The Mongolian dam on the Selenga in particular could decrease water level in dry years due to the greater number of reservoirs in the basin needed to feed the hydroelectric power station, endangering near-shore biological communities,” Simonov says. He rattles off a name of plant an animal life that the locals depend on, like the Baikal omul, a white fish delicacy that was listed as an endangered species in 2004 due to over fishing.